Both Ramanand Sagar's Shri Krishna and Meenakshi Sagar's Jai Shri Krishna showed one of the most popular and famous RadheKrishna stories in their show, Radha dressing up as Krishna and Krishna as Radha to show everyone that they are in truth only one soul in two bodies. When watching this story in the serial(s), I wanted to find out the real story behind this scene, because as we know....serials sometimes tend to glamor up a story to make it more interesting to viewers. And though I don't know what the actual scriptures say about this story, I came upon this one website that explained it, and it's really interesting. If this website is anything to go by, both SK and JSK showed this scene pretty accurately. in Each Other's Clothes (Lilahava). "In order to get close to Srimati Radharani who is upset with Him, Damodara has dressed as a heavely Kinnari goddess, holding a beautiful gold and silver vina. The sakhis then ask the Kinnari goddess what is her name and if she can sing a song to cheer up Srimati Radhika. "She" says Her name is Shyam Sakhi, since "She's" blackish and sings a song that plunges the gopis into ectatic bliss. To reward Shyam Sakhi, Radharani is about to give her the jewel locket from Her own neck. Lalita notices that this "sakhi" is bent in three ways and points it out to Sri Radha. But seeing her beloved dressed up this funny way, She can no longer maintain her anger." 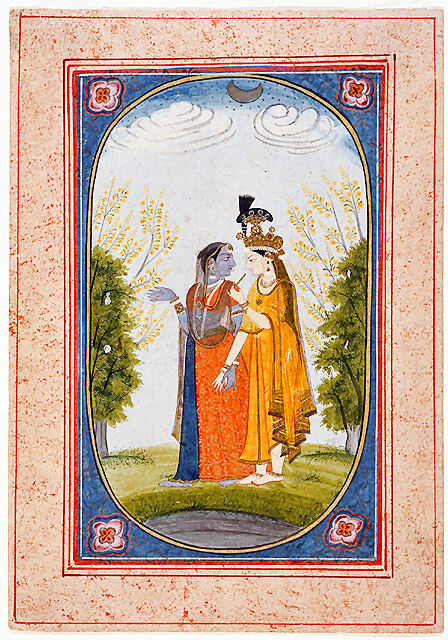 (Radha and Krishna Dressed in Each Other's Clothes (Lilahava). India, Punjab Hills, Kangra, 18th century. Opaque watercolor on paper. 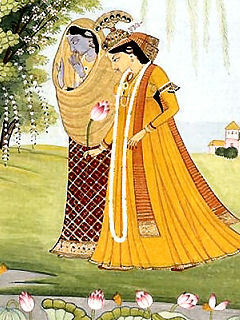 Standing with a symmetrical landscape of yellow flowering creepers emerging from the greenery of trees, Radha, holding Krishna's flute, has donned her divine lover's peacock-feather crown and saffron-colored dhoti. 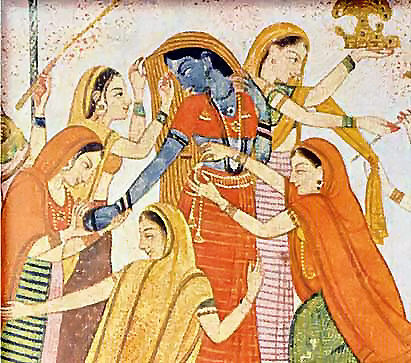 Blue-complexioned Krishna, in turn, wears Radha's earrings, red skirt, blouse, and transparent shawl. Holding hands, the two gaze into one another's eyes. 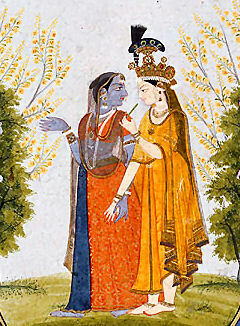 This unique visual motif of the clothing exchange serves as a metaphor for Radha and Krishna's shared essence. 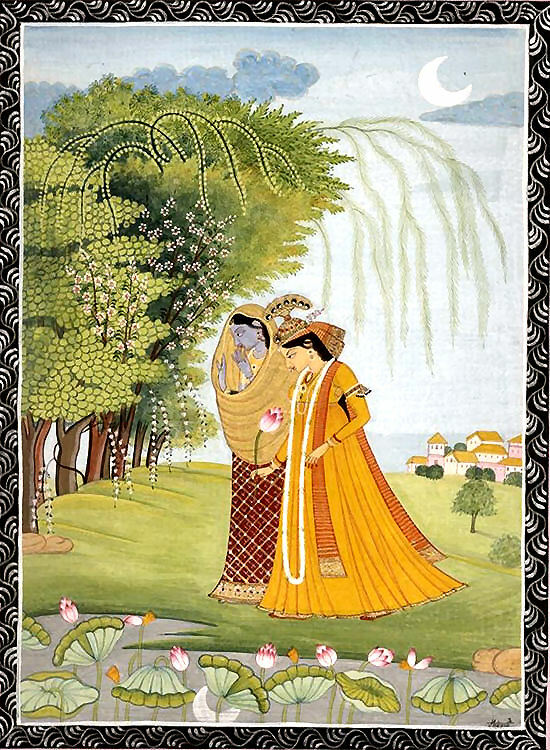 Radha's and Krishna's donning of each other's garments signifies that the two are identical, as is suggested in this verse by an unknown poet. This pastime is known as dan-lila or matuki-lila. These pastimes are re-enacted each year during the burhi-lila festival. In this pastime a boy playing Krishna stops another boy dressed as Radharani, who tries to walk by carrying a pot. Sankari means "narrow". This narrow passageway is between the village of Chiksoli (Citra) and the town of Varsana. The path becomes very narrow at this place, with the rock coming down sharply making a V. You have to be careful that you don't fall walking through here. How To Get Here If you just came down the steps from the Larily Lal Temple, you make a right. You walk 80m and make another right. You follow the road around for about 200m. At this point the road turns left and bears to the right. You turn left and go 30m and make a right. The road goes through the village for 300m and then becomes a path for 700m. At this point you come to Sankari Kor. You can also have your taxi take you here. By taxi you come to the other side of Sankari Kor, near Mayur Kutir, in the village of Chiksoli. Nice post Janu! It was very informative. Unfortunately I have not seen the same from MS's Jai Shree Krishna. Can someone post the vid? And thank you so much for posting this, Janaki Di! ^ Thanks for posting the vid Aishu, will watch it asap. Lols, I was just going to post the JSK one, Aishu, but you beat me to it. Thanks for posting the SK song, Vedo, it's one of my fav in the serial. I really love that scene a lot too, Swapnil and Shweta were really cute in it. It starts around 2:00 and continues till the end of the vid where Golok Krishna mirrors Bhulok Radha's thoughts and words. Btw Aishu and/or Parina....I have a question. When I watched JSK while it was first airing, there was a gap where I went to India and missed some Meghan-Kritika episodes, including this one. While watching this scene again, I noticed something. Why were some of the gopis talking so bad about Radha and going to her mother with complaints about her conduct with Krishna? I didn't get that scene...I thought the gopis were her friends? Or were those two women in the next part not the gopis but some other village women? Oh those weren't Gopis! They were Satvanti and Gunvanti Kaki! 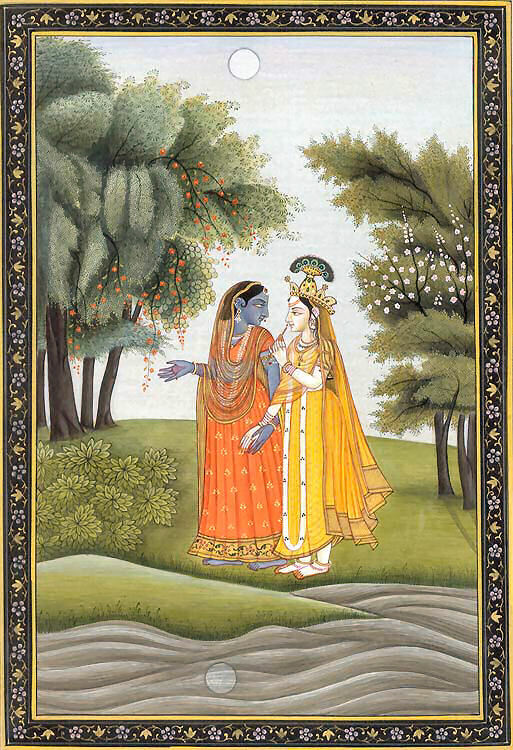 They're kind of representing society and how it gets between Radha and Krishna's love. Oh, so were they supposed to represent the society that talked against Radha for being seen with Krishna before marriage and all? Hehe, I thought they were gopis.